Strawberry jam with Pecorino Romano cheese - my favorite! I love the taste of homemade jam with a real berries in it, just as my grandmother use to make it. I love to smell a strawberry all over the room when I open a jar. 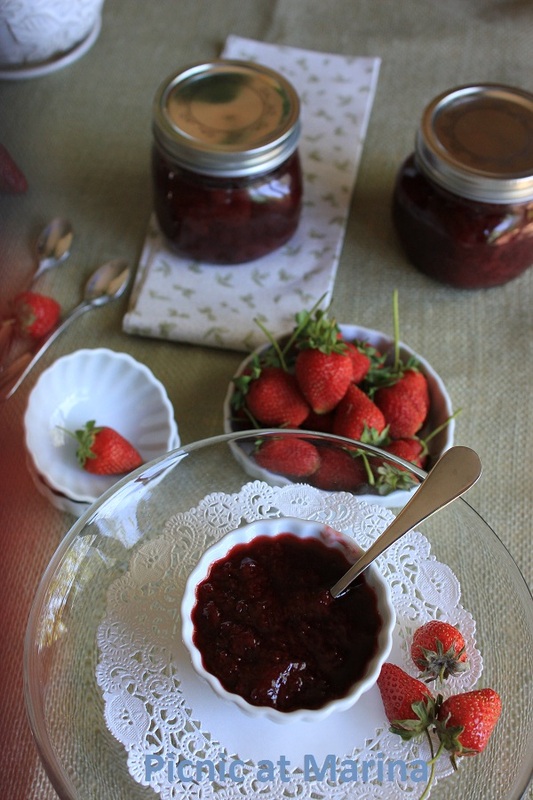 I love to pull a spoon full of strawberries with a dark thick liquid sliding over the sides... And as I lick the drippings from the bottom of the spoon, I love to close my eyes and dive into the strawberry "nirvana"... That's what the real strawberry jam is all about for me. Here is how my grandmother use to make it, my mother makes it, I follow their recipe, and I hope my kids would do it too. Start with a strawberries, I like to use the smaller size, if available. Wash it, remove the stem, and measure. For many generations in my family the ratio stays the same: two parts of strawberries to one part of sugar (*- see note below). Cover the berries with sugar in a pot it will be cooked, and let it sweat to release the juice (it would take about 3-4 hours). Then place the pot on the stove and bring it to a boil, reduce the heat to a medium high and boil it for 5 minutes, stirring it once or twice. Turn the heat off, skim all the foam on the top, and let it cool completely. Make sure the area is clean and pot is away from a heavy kitchen traffic so nothing gets into the pot. Repeat the boiling and skimming process three times, letting the jam to cool completely between the boiling. After the third boiling, pour the jam into a clean jars (** - see note below), let it cool and place in the dry cool area for a storage. I keep mine in the refrigerator. Mother keeps hers in the cool basement (cellar). Mother calls this recipe "Five minutes in tree days jam" as she cooks it three times during three days before she cans it (so do I). * Note: many books and USDA website suggest using twice more sugar and pectin to make strawberry jam. ** Note: follow the canning guide. The only jam I eat is th strawberry one. I love strawberries and this type of jam is irresistible. I like the fact that you don't use so much sugar. I prefer the natural sugars coming out of the fruit itself. 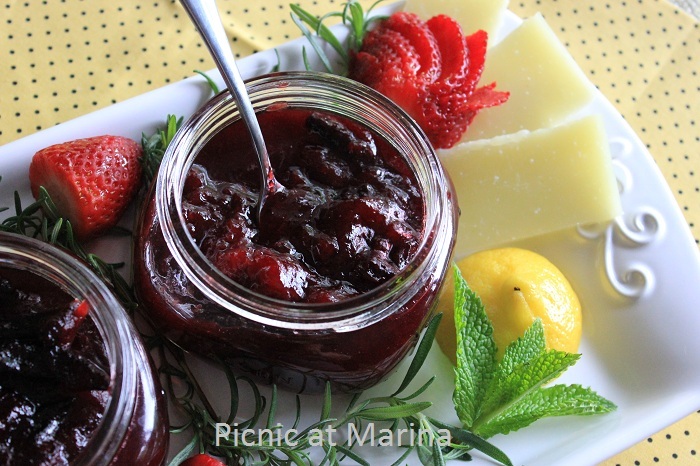 Great looking jam and since it is a family recipe it has a special value! Thanks Katerina! I don't like too much sugar myself, and always look for ways to cut it down. This tree days process allows fruit to absorb sugar yet remain tasty. Really interesting method - I have only ever made jam with one boiling. How do you think if affects the taste of the finished product? Preserving the season is the best way to go! 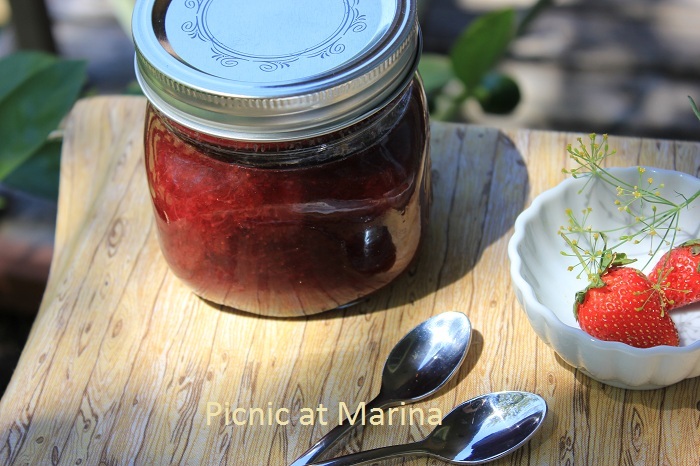 I love making jam and will definately try this recipe this summer ad I've been wanting to attempt not using pectin. Does it store well with the reduced sugar or do you have to refrigerate it? Thanks so much for sharing the family recipe! I refrigerate it, my mother keeps it in the basement. The important thing is to make sure area is clean and nothing gets into the pot (no bread crumbs, no other particles). Sugar was always expensive and people use to preserve with less sugar all the time. I don't know why now sugar is increased to enormous amounts! You can go with even lesser amount of sugar but then you'll have to freeze it. It tastes very good, I don't have my freezer now, otherwise I would do it with less sugar and freeze it. SIMPLY DELICIOUS, ARE YOU GONNA SEND A JAR THIS WAY? JAJAJAJAJAJAJAJAJA YUMMI YUMMI. hUGS AND BLESSINGS TO YOU MY DEAR. There are few things nicer than homemade strawberry jam - can't wait for strawberries to come into season here in the UK (the ones in the supermarkets right now are the rock-hard greenhouse ones). Thanks Katy. Yes, I know what you mean, greenhouse are rock hard and tasteless too. Yum! I love homemade jams as I use them in my baking projects. Love your photos! 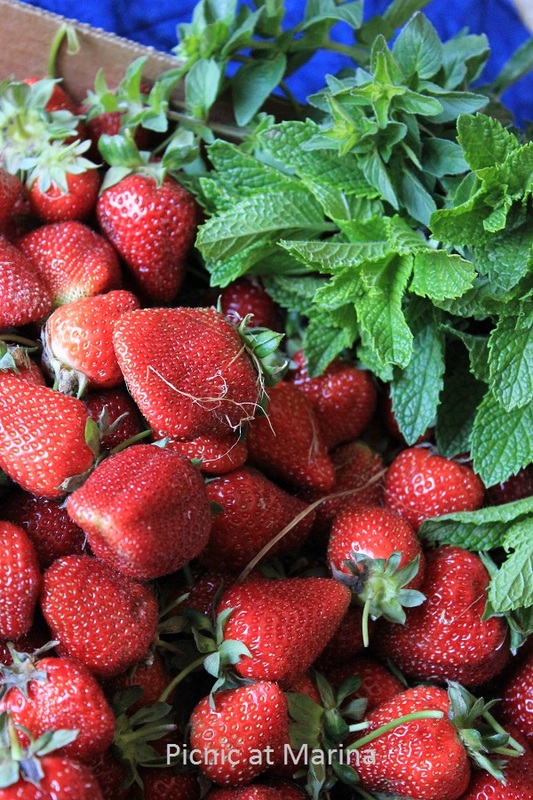 I ma so so anxious to be in Strawberry season; your jam is perfection; I can almost taste it.